Tapering to a point. (example: Catalpa, leaflet of Cedrela). arrangement of leaves or buds arising from different points and on opposite sides, of an axis. Only one per node (# opposite ). leaf stalk is branched, each member carrying leaflets . Example: Kentucky Coffee Tree. 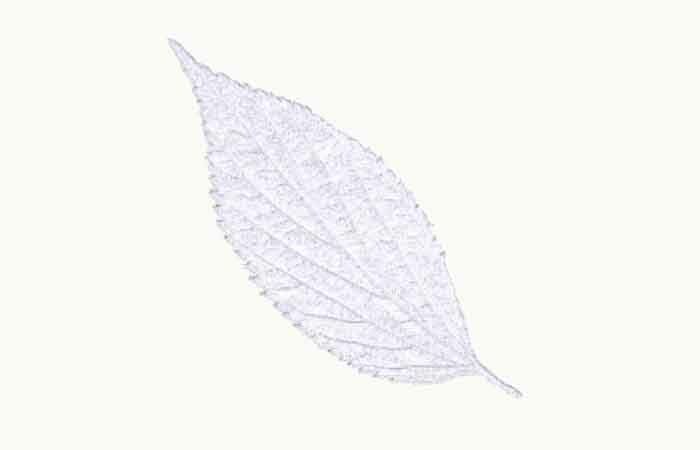 leaf composed of leaflets on both sides of an axis, the spine (# simple ). If the number of leaflets is even, the leave is paripinnate, otherwise it is pinnate. which falls once a year, usually in autumn (# persistent ). The tree is called "deciduous". enveloping the base branch. Example: flakes of cypress. leaves budding alternately in a plane rotated 90 °. Examples: Maple. leaves growing in the same plane to catch maximum light (# decussate). Examples: Hornbeam, Oak, Elm, Linden. leaves budding on the same node beam and not the periphery (# whorled ). smooth, hairless (# pubescent ). leaf size and shape varied on the same branch. Examples: Western hemlock (Tsuga heterophylla), Beech heterophylla, White Poplar, Mulberry white and black. leave composed of an odd number of leaflets. Examples: Tree of Heaven, Mountain Ash. divided into deep lobes and acute. Example: silver maple. literally "little leaf". The leaflets consist of both sides of the spine, a leave "composed" (eg Ash). .
enlarged and flattened portion of the leave that captures sunlight. .
leaf whose blade is carved in the shape of lobes. Examples: most maples. leaves wither on the tree before falling (they are often in the winter). Example: leaves of chestnut, oak, beech. sharp, sharp. Example: flakes of cypress. Leaf narrow, glossy and pointed, some conifers. leaves or buds begin on the branch opposite each other on the same node (# alternate ). Example: Maple leaves. compound leaves with leaflets that are connected to a central point (the end of the petiole), from which they radiate like a fan, as in the horse chestnut. leave having an even number of leaflets (or pinnae), that is terminated by a pair of pinnae as opposed to a single pinna. Examples: Black Walnut, Cedrela. .
remains green over a year. This does not mean that the leaves remain evergreen. They recycle a period which is not annual (but every two to five years). The tree is therefore leaves a year or two, etc.. that are green at the same time. The conifers are generally evergreen (except the Ginkgo or Larch). Part of the leaf that connects the wide part (limb) to the stem. composed of leaflets arranged like the barbs of a feather (quill). If the number is even, the leave is paripinnate, otherwise it is pinnate. leaf (or stem) with a blade or the edge is covered with silky hairs (# hairless ). Example: Beech leaf (pubescent on the periphery). vein in the leaf when the sap flows. leaf (or flower) without petiole (respectively, without stem). leave composed of a single blade at the end of the petiole (# compound ). spatula-shaped (larger width to 2 / 3 approximately). Example: leaf deciduous magnolia. Appendix to the base of the leaf (eg in the hawthorn or quince), which falls early, and sometimes gives a thorn (acacia). leave covered with a dense coating of short hairs (denser than "hairy"). leaf lamina with small teeth (saw). Example: Hornbeam. leaves born at the same point by at least three, around the branch or stem. Example: Common juniper needles. small dry fruit indehiscent (not opening at maturity). Ex: charm. fleshy fleshy fruit wall, containing seeds which are the seeds. central part of the fleshy fruit. Examples: peach pit, olive pit. inflorescence-derived form, comprising an axis on which are grafted flowers which bloom starting from the end. a double flower has a large number of petals from the transformation of stamens or pistils parts. Thus, it is sterile and the tree that bears do not produce fruit (ie cherry decorative). fleshy fruit (which resembles a bay). The wall is wrapped around a core that contains the seed. Examples: fruit of the holly olive. Flower provided for both sexes, male stamens and ovaries. Example: flower of the family Rosaceae (cherry, apple, ...). spike of small flowers (pollen and fruits are dispersed by the wind). Example: kittens Willows. dry fruit with a hard envelope. Example: Nuts (edible) of Walnut. female receptacle which contains the eggs, themselves housed in carpels (2-5 in the Rosaceae, subfamily Malacées). It gives a fruit (eg apple). Only species angiosperms have ovaries. part female, fertilization by pollen, produces seeds. bunch of flowers upright. Unlike thyrsus, branching stalks before grafting on the main axis of the inflorescence. The flowers bloom in starting from the axis. Example: flower of Paulownia. small stalk which bears a fruit, a flower or a bud (the bud stalk is that the petiole is the leaf). female body including the ovary, style and stigma. male fertilizing powder formed in the anthers, terminal portion of the stamens. Pollen contains the male gametes. In advanced species (dicotyledon), gamete unites with the egg and from this union, appear seedling containing the seed. Another gamete unites with two nuclei of the egg to form the endosperm, which will be used to accumulate reserves. female part of a flower that receives pollen and leads to the ovary. flower cluster of pyramidal shape. Unlike the panicle, the peduncles grafted directly on the main axis of the inflorescence. Example: Horse Chestnut. provision of flowers in umbrella. Example: Elder flower. tree that is pollinated by the wind (# Insect). Examples: Alder, Birch. For more details see " what are the flowers? ". Plant flowering plants with a flower drawn, whose ovules are enclosed by an ovary that gives the result (# gymnosperms ). in the conifer sprout elongation or vertical branch located at the top. part of the trunk of the tree beneath the canopy . rounded outgrowth on a the trunk cbelow the lower branches. Example: in the black poplar. tree that supports calcareous soils. Examples: Mediterranean species such as oak, pubescent oak, cork oak, maritime pine. tree that does not support calcareous soils. It prefers acidic soils (pH <7). Example: Rhododendron. total releases coming out of the stump after cutting a tree. Example: White Birch , Dove-tree , Katsura . tree that bears cones. Most conifers have needles that are persistent, but not all (ginkgo, larch and dawn redwood are deciduous). Their port is often tapered. all branches of a tree and upper part of the trunk. all plants without flowers or seeds: algae, fungi, ferns, lichens, mosses, ... (# phanerogams). The plants are the oldest and most archaic (there appeared 450 million years ago). flowering plants (angiosperm) that the seedling has two cotyledons shrubs and deciduous trees, annuals and perennials ... (# monocotyledon ). species whose male and female flowers are borne on separate feet (# monoecious ). Examples: Mulberry, Walnut, Willow. For more details see the file " what are the flowers? ". plant growing on another tree and picks up moisture from the air without taking root in the earth. Example: Banyan. form of tree trunk like a barrel of twin columns. Example: Hornbeam. plants flowering with a very small flower, whose eggs are not protected by an ovary. The seeds are not protected by a fruit. The seed has at least two cotyledons (# monocot ). Example: the conifers . species that prefer the sunshine (# sciophyllous ). Examples: Hawthorn, Fig, Mulberry. tree that needs a waterlogged soil (# xerophilic). Examples: Taxodium, Erl. tree that is pollinated by insects, bees, butterflies (# anemophilous). For more details see the file " what are the flowers? ". Opening on the bark of cherry trees which allows air to reach the underlying tissues. flowering plants (angiosperm) which contains only the seedling cotyledon. They do not produce wood. It has no trunk or branch, but a "stipe" (# Broadleaf ). Examples: grass, palm. These plants grow in height but do not get fat. Their flowers have usually three petals. species whose male and female flowers are on the same tree (# dioecious ). Examples: Rosaceae (cherry, apple, etc. ..). literally "who likes nitrates. Tree that requires a soil rich in nitrates. Examples: Maple, Ash, Elm. intersection of a leaf on the twig, or a twig on a branch or a branch on the trunk. The fall of the leaf, twig or branch footprint. We find the knot in the wood of the trunk. all plants whose mode of reproduction is based on flowers and seeds (# cryptogams ). The trees belong to this category. species that colonize marginal lands (these species are not nitrogen-loving). Examples: birch, pine. piece of bark that comes off the cambium. It is separated from the remaining plates (# scales, which overlap, do not reveal the cambium). Ex: tree. thin, stacked, a bark, which stand out as it matures. Unlike the plates , they overlap like fish scales. Example: maritime pine bark. The scales are also the leaves stuck to the branches of cypress and red cedar (squamiformes "). tree that can grow in the shade (trees heliophilous ). Examples: oak, beech. woody plant having a trunk only able to branch out into branches, and height exceeding 6-7 m tall. Smaller is a shrub. woody plant having a single trunk, as the trees, but no more than 6-7 m tall. Example: Apricot. woody plants with multi-trunks and not exceeding 6-7 m tall. Example: Walnut. tree that grows on dry soils (# hygrophilic ). Example: juniper. Copyright © 2011 PYL- European trees .